O.K. I must confess I was having so much fun making this card that time got away from me. All of a sudden I looked at my watch and it was way past time for me to go take the dogs on a walk. No wonder poor JR had his legs crossed. I really couldn't help it though because I kept getting ideas and the card evolved from its bland conception into this unique card. The card base is a deckle edge announcement card. The person this card is for gave me the blank cards as a gift. So being the frugal crafting person I am I have to use them even though usually I make standard size cards. I knew I wanted to have dresses hung on a clothes line. Alas I could not find a dress template I had. Paper Crafting Connection came to the rescue with a cute little girl dress jpg. The back piece had the sleeves and then the front like a jumper. Originally I was going to cut the back out of rice paper but I discovered that it just won't cut with my Cameo. Oh well I will use it for something else. Then I found a scrap of pink vellum and I thought aha that would be perfect. The front is cut out of two different pieces of scrapbook paper. One from Monet water lily scrapbook paper and the other from a sailboat paper. I cut the dresses out sideways and got these interesting patterns. It would be fun if a person had a lot of scraps to cut the dresses out of different papers. The person who is getting this card gave me the glitter alpha stickers. Usually I don't use stickers even though I must confess I have a bunch of alpha stickers in my stash. 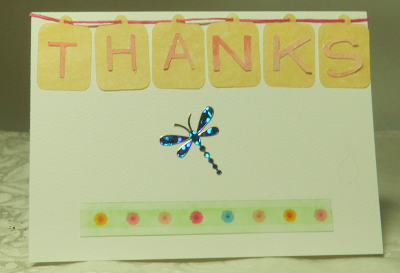 There you have it my thank you card using the stickers and blank card that were a gift. Also after cutting out the embossed piece I am looking at my embossing folders in a new light. Thinking how I might emboss on card stock and just use part of what I emboss. Perhaps it is also time that I start using some of the alpha stickers I have. LOL! O.K. I'm off to play with the Hot Boss Embossing tool that was in the package from the North Pole. I want to do something with it for another thank you card. Christmas is over for another year as far as most people are concerned. However, for me since Christmas is all year long you may if you chance to stop by hear Christmas music playing even during the heat of July or August. I hope if you celebrate Christmas that you had a wonderful one. I was spoiled by my roommate. LOL! Which is probably why he gave me a lot of bath products with different scents. His mother and sister gave me a few crafting goodies. Then I had a surprise waiting for me at the Post Office. I know you might not believe this so I might have to take a picture of the box and some of the contents. Yes, as unbelievable as it may sound I received a box from the North Pole filled to the brim with crafting goodies. It was left at the Post Office on the 24th. My dogs were giving me a funny look as I unpacked the box and was jumping up and down in excitement. I'm sure they thought that I had drank a little too much hooch. O.K. I know you want me to get on with the post. Just had to share my excitement. I was taught to write and mail thank you notes before I played or wore anything that was a gift. Although I verbally thank people who give me something or write an email to thank them I still make a point if I know their address to send a thank you note or card to them. That is just the way I am. Here is my first thank you card. I broke my rule about not using anything till the person is properly thanked because I was given the stickers and decorative tape. My dear friend Alice Golden had an assortment of tags strung on scrap floss on a scrapbook layout and I really liked the look of it. (If you are stuck for inspiration check out her blog Golden Moments. She always seems to have ideas that can be used for other projects.) Although her tags were not all the same I decided to go with the same ones. This is the free tag file in Studio. My Cameo cut them out of a scrap of left over calligraphy paper. The letters were cut out of scrap card stock. The scrap floss (which is not really scrap) is by Karen Foster. I am so in love with this floss and it comes in so many scrumptious colors. The dragonfly is a vinyl sticker that was in the sticker sheet. I love how it shimmers. I would have loved to have stuck it on card stock and cut around it so I could pop dot it but the Post Office is getting more fussy about having bumpy things on cards. I used the Touch 'N' Slide daisy tape on a narrow piece of scrap card stock. Then I went and chalked over the tape with my green chalk to give more the impression that the daisies were growing in grass. Since the person who gave me the Touch 'N' Slide Decorative Tape Pen with the daisies tape probably won't be reading this I can tell you to skip it. In my honest opinion it is not worth the money. Although the tape cartridges are easy to change you are limited as far as getting designs. As well as limited as to the colors. Plus I had the experience of the tape tearing when I tried to apply it to card stock. I wasted a lot of the tape before I got a nice border. Now having said this let me say that I do appreciate the fact that I was given something different which I had never played with nor heard of before. It probably would be fine for children but not necessarily for someone who is serious about their crafting. For me this is a better alternative. Although I don't know if I can chalk over the tape.Just for fun I used my warm wishes stamp with Stazon ink on clear tape. It works and you can have a personalized tape for less money. Especially if you have a lot of smaller size stamps like I do. I have not tried marker stamps yet so I don't know if the marker ink would smear on the clear tape. The Stazon ink didn't smear at all. Now to find another craft yard sale where they are selling Stazon ink. I will be using tags on floss on another card which I hope to post next. 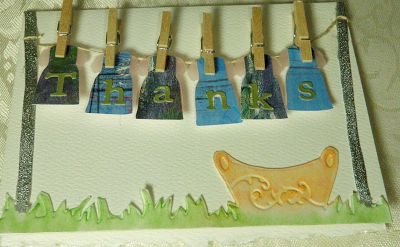 Since I will be hand delivering the thank you card I'll use small clothespin which are in my stash.Alas when mailing cards they are not practical to use.I also will be busy playing with my new toys and I'm sure will be posting some projects using those. I think I can come up with some unique cards which can be mailed without paying extra and without the cards getting destroyed. Happy Frugal Crafting till we meet again! Just in case I don't get around to posting till the new year I want to wish you a Happy New Year! May 2013 be a year full of frugal crafting and fun. I have no idea how I managed it but while I was cleaning out both of my blades for Cameron today I broke the housing. Although I have a couple of blades which will get me by they are either clogged or dull enough that I can not cut intricate shapes with them. That meant it was back to the drawing board for a card for someone special. 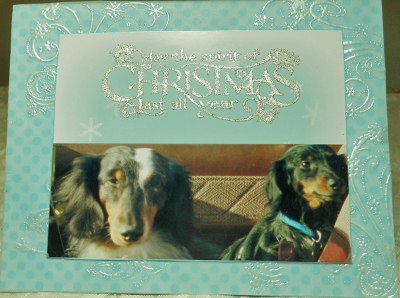 I was still able to use the heat embossed vellum I had already made just ended up trimming it to fit the card I made. Then I didn't like the photo collage I had originally made so it was back to the drawing board. The pictures were not as good of the dogs as I would have liked. No matter how I tried to enhance them. Getting good pictures of the dogs is as bad as trying to get good pictures of some children. Usually at least one of them is looking away from the camera or one of them moves just as I snap the shutter. Anyway I thought I had lost a lot of pictures when my laptop broke and at the same time the card in my camera became corrupted. However, for some reason when I had backed up the laptop onto my external hard drive it had put all the pictures in a folder for the date I backed it up. So of course when I transferred them to my new computer they went into that folder. Anyway while looking through the folder I found the perfect picture. So into Photoshop Elements I went to make a new photo to use on the card and to do cropping and enhancing of the original photo. Well you know how it goes one thing leads to another. I was looking at the artwork design I planned to use for my background and was thinking I bet I could stamp a sentiment on the photo after I print it. Then I thought why not heat emboss the sentiment. Of course that meant spending some time seeing what ink might work for heat embossing. For the card base I ended up using a piece of double sided card stock I bought at a dollar store.If I can find more of this card stock I will buy it as it really cuts nicely. I bought several colors and patterns. The snowflake swirls are stamped on vellum and heat embossed. I rubbed blue metallic chalk on the back of the vellum. I don't know if that is what caused the vellum to not stick to the card stock using a glue stick because usually I can use the glue stick and the vellum will stick. I ended up lightly spraying the front of the card with spray adhesive and after carefully rubbing the vellum down placing it under some books. In Photoshop I did not like the color that the snowflake artwork was so changed the color of blue. Then added my cropped, enhanced image. After saving my image I printed it on glossy photo paper. Then I trimmed the photo and edged it with sky blue metallic ink. Then I heat embossed the sentiment. Letting my breath out when I was done as I had been afraid I was going to mess up the photo. I buy my photo paper at a dollar store when they have it. I usually buy several packs of it. So I don't mind using some of it to play to see what works. I'm glad I did play before trying to heat emboss the sentiment on the printed image. 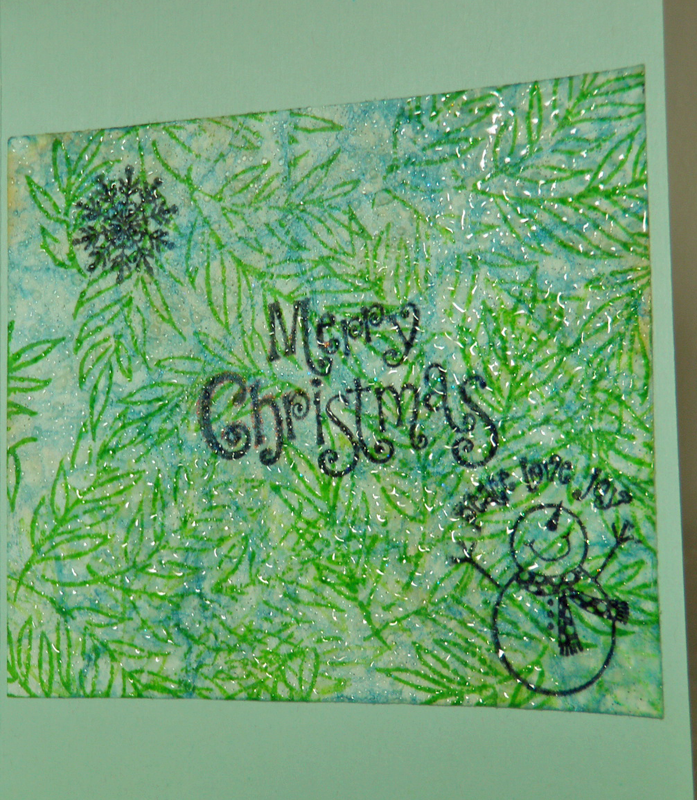 My embossing ink did not work, nor did many of my pigment inks. However, I had found while looking for a certain ink for my sister Brilliance gold and silver ink which I had to buy. They both worked great. Maybe because they were really moist. Now that I know that heat embossing can be done on photos a whole new world has opened up for me. As well as I may just find myself printing and using more of my photos on cards. Thank you for stopping by and thank you if you have read this far. Wishing you Happy Frugal Crafting till we meet again and a Merry Christmas if you celebrate it. I used the frame file that can be found. Here I took the frame and was able to weld a plain rectangle the same size to make my card base. I also cut out a frame to use. After the pieces were cut out I cut out a piece of vellum. I stamped with my snow flourish stamp with white embossing ink. 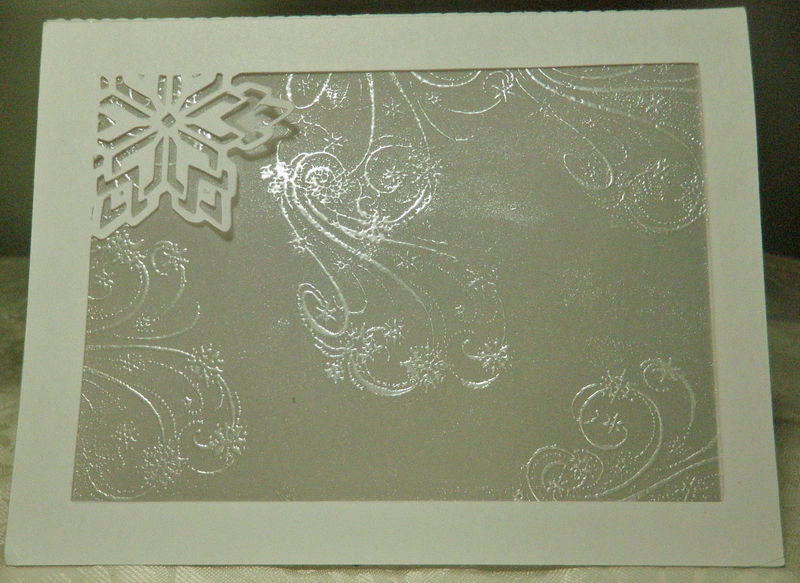 Then sprinkled Recollection Snow Pearl embossing powder. Carefully I used my embossing gun. I then glued the vellum on the frame piece and then glued it on the card base carefully matching up the cutout snowflake. I think it looks more finished this way. Then I stamped my sentiment on vellum and using a glue stick glued it on the inside. You could also do the same thing using a printable transparency. Just be careful heat embossing on a transparency. It is a little more trickier than heat embossing on vellum. Off to deliver cards and ornaments in boxes. Thank you for stopping by. Wishing you Happy Frugal Crafting till we meet again! Last year I downloaded somewhere a folded star. I thought it was a 12 Days of Christmas cutting file from Silhouette but it appears not to be. However, the Silhouette store does have a cutting file for a 3D star. I had planned to put together two stars to make a 3D ornament last year but time got away from me. It then ended up on the back burner for this year until my good friend Alice Golden posted a ornament Here . 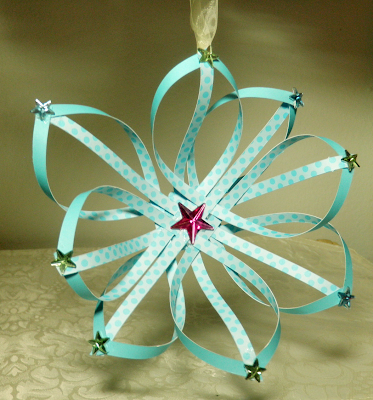 Don't worry if you don't have a cutting machine you can still make this ornament. You will find a link on her blog which will send you to where the instructions and pattern is. So here is the ornament I made today. I used the green card stock that came in a package of a Recollection Christmas collection for the front and back of the star. 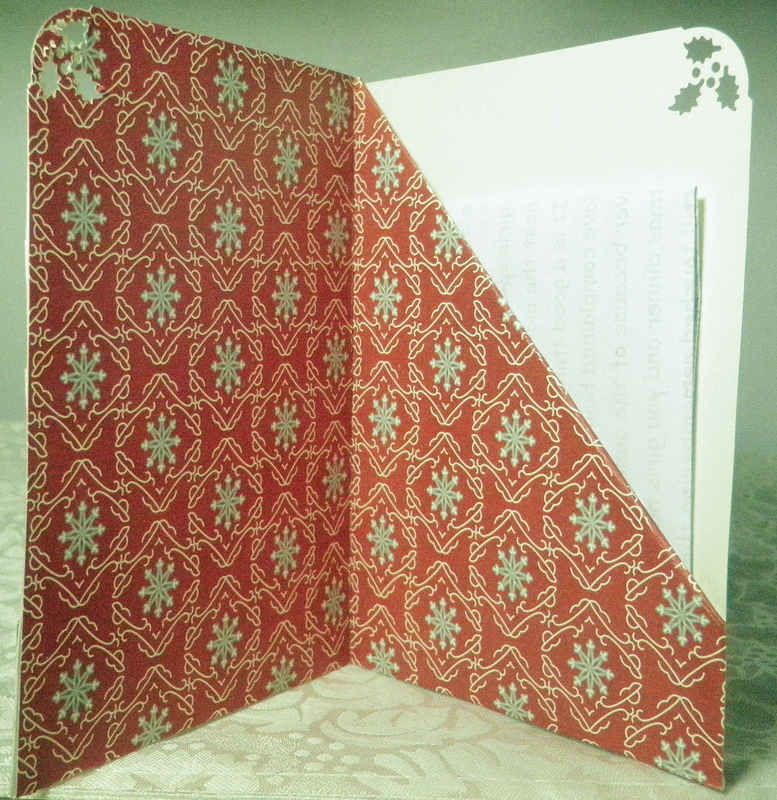 Then used two different pieces of pattern card stock from the set. Of course if you have scrap paper or card stock this would be a great way to use it. 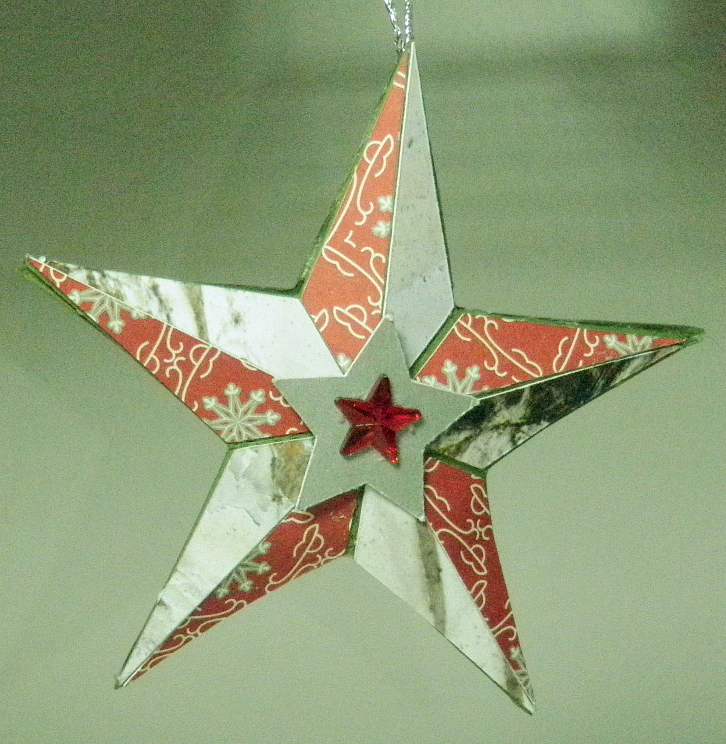 The silver star in the middle was cut from a scrap of shimmer card stock I found. 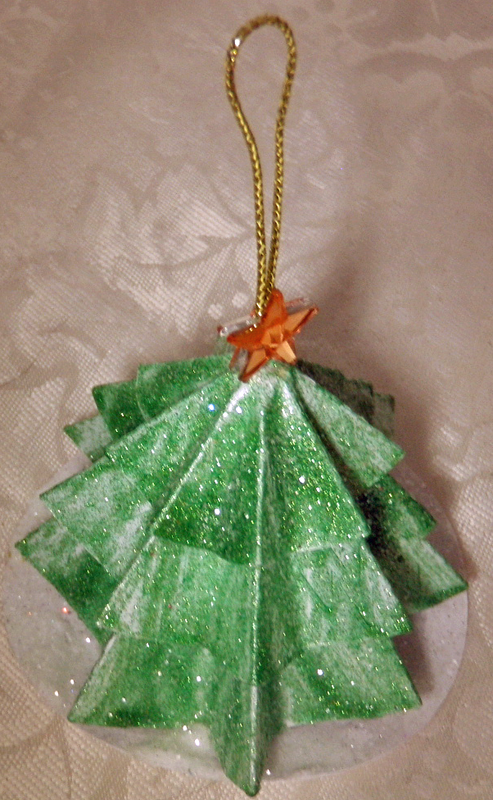 Then of course I had to use one of my dollar store star gems for the very center. I need to do some tweaking of the cutting file and replace my blade but on the whole I'm pleased the way it turned out. Anyway I think the woman I'm giving this star ornament to will like it. After all it is the thought that counts. O.K I'm out of here as my roommate just called from work an hour ago and asked if I would make a special Christmas card for someone. Thank goodness I designed a card yesterday but haven't cut or put it together with the theme he had in mind. LOL! He is insisting on paying me and will not take no for an answer. Also unlike most of his requests he doesn't need it in five minutes. I don't like to wrap packages. Also for the most part I think it is wasteful. LOL! Most people are not like me who carefully opens packages and then saves the paper to be reused in some way. Don't get me wrong I'm not saying for you to not use wrapping paper this is just my preference. However, I also don't like to hand someone a gift in a plain box. 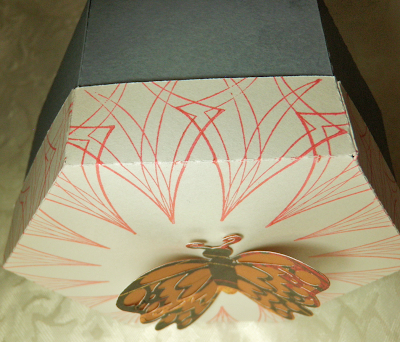 Whether it is a handmade box or a store bought box I like to gussy it up a little bit. It can be a lot of fun to see what I come up with. Besides if the box is gussied up the person receiving it is more apt to use it instead of throwing it away. 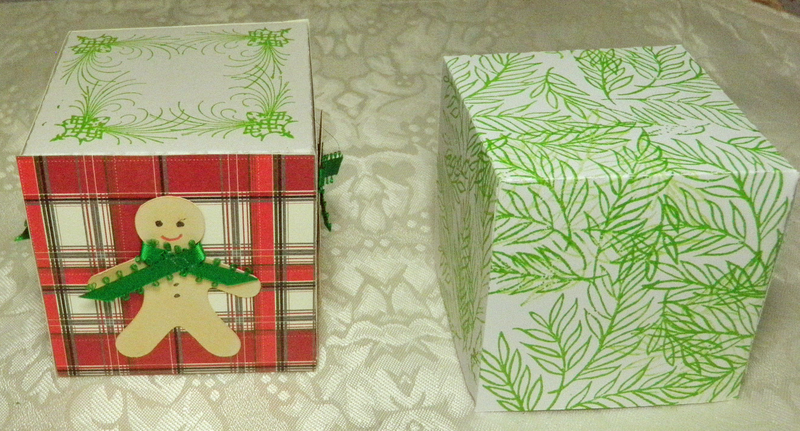 Here are two boxes I just made for ornaments. The one I stamped all over before putting together was the quickest. It also fits more the personality of the person who I'm giving the ornament to. 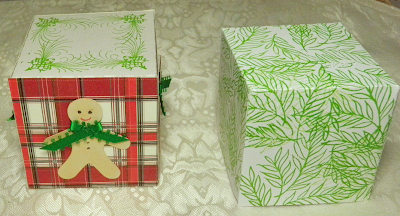 The all over stamped box I used my foliage cube stamp and Stazon Cactus ink. Since it holds the tree ornament I thought the stamp was perfect. The second stamp I used a flourish stamp from my stamping gear and just used it on the paddle not with the gear stamping in the corners on the top of the lid. I felt like the box needed something and after playing with several different ideas this is what I came up with. I cut panels from Recollection Christmas card stock to go on the side. The Gingerbread man is a free Studio file or I think he is. He might have been a 12 days of Christmas last year. I just cut out his outline from scrap gray card stock. I used chalk to change his color. He looks more like a Sugar cookie but we won't tell anyone. I added his eyes,mouth,and buttons with gel pens. Glued ribbon for a scarf and he was done. I had to cut out an extra one though because one of the four ran away. Luckily there was just enough room on the scrap card stock to cut an extra out. I'm sure I'll find the missing one and use him on another project. Unless one of my dogs decided he was so yummy looking and ate him. I encourage you to get out those bits of paper,ribbon,the stamps that are collecting dust and gussy up those plain boxes. Go ahead and use the Christmas paper and card stock you are hoarding. You know you really aren't going to want to use it next year anyway. There will be new Christmas stuff out and you are going to want to use that instead. Thank you for stopping by and do come back. I'm back to seeing if I can figure out how to design a pop up card for someone special. As well as making more ornaments and boxes for neighbors and local friends. When I saw the free file in the Silhouette store of a 3D tree I knew I wanted to use it for something but wasn't sure what. On the Silhouette Blog they showed the large tree used in a jar as a snow globe. There was also a mention of layering the circles. So I decided to see if it would work as an ornament. For some reason when I tried to cut out the pieces Cameron my Cameo cut wacky. I think he didn't like the way the circles were placed. I've noticed he can be very particular and will not cut where he is suppose to if an image is overlapping another even if it is just empty space and not where he needs to cut. I ungrouped the shapes and left only the three smallest circles and the plain circle on the mat. I was able to get all four shapes on a letter size piece of heavy white card stock. I made accordion folds on all the pieces with perforated lines. It is easier to fold them back into shape after the paint has dried than to paint a shape with perforated lines and then try to fold. I learned that on another project with perforated lines. Especially since the paint hides the perforated lines. I first painted with Folk Art Peridot Extreme Glitter paint the perforated pieces. Then while the paint was still wet sprinkled some Martha Stewart coarse crystal glitter in places. After the paint was dried I refolded so that I had crisp folds. The paint has a tendency to flatten the pieces out a little bit. I took wire cording and formed a loop then pushed it through the perforated pieces. There is a small hole in the center of the circles. After all three pieces were strung on the cording I tied a knot on the under side so that the cord could not be easily pulled out. The plain circle I poked a hole in the center. Then I brushed Elmer's glue on it and sprinkled with the Martha Stewart glitter. In some places I then squirted a little more glue so that it would look like snow drifts. I then poked the cording through the circle and glued the ends of the cording on the bottom of the circle. I had bought some gem stars at a dollar store and decided to glue one on each side of the loop. I will be giving this tomorrow to a woman whose Mother was just diagnosed with Alzheimer. I hope it will bring her joy when she looks at it. If her Mother is up to it I'll also take the Mother out for an hour or two. This way the woman will get a short break. Alas being the sole caregiver for my late husband with Alzheimer I know how important getting a break can be. So I'm going to try to give her some time to herself off and on. If for some reason you did not get the 3D tree the file is still available through the Silhouette store. Right now it is $.75. So it is a little bit of a saving. Also don't forget that Silhouette is having their 12 days of Christmas. Every day there is a free shape just for that day. Thank you for stopping by and do come back. I'm off to making more ornaments for gifts. Wishing you Happy Frugal Crafting till we meet again. My dear friend Alice Golden posted on her blog here some adorable double pocket cards. They were part of a make and take by Karen Foster at a crafting shindig. Alas I don't have any Karen Foster Christmas paper but I do have some Recollection Holiday card stock. So I didn't use card stock on the inside of the card. I did use a piece of card stock on the front. I had forgotten that the words would be upside down inside when I folded the Happy Holiday card stock. 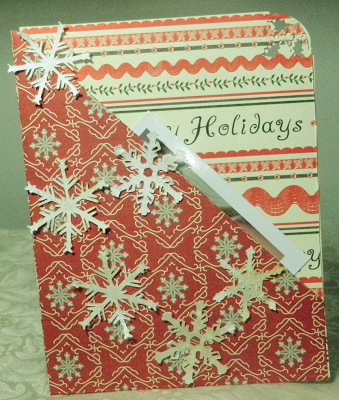 Not being one to waste I cut a panel from the Happy Holiday card stock. LOL! I'm sure the rest of the card stock will be used for other projects. I put a photo in the front pocket but anything could go in there and the inside pocket I placed a letter. This card would be great for putting tickets in, a letter,photos or other things that you might want to give to people. These cards are quick and easy to make. You could add any embellishment you wanted. 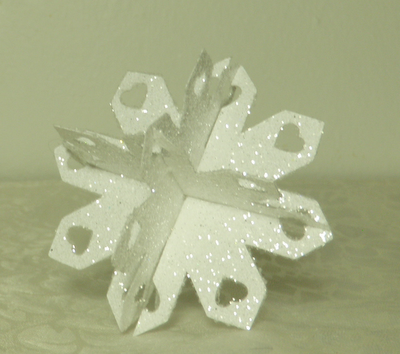 I used the free snowflakes from last week which I resized. That's all for now folks. Hope you are getting everything you need done. Thanks for stopping by. Wishing you Happy Frugal Crafting. Since the roll of wallpaper I had on hand I paid less than a dollar at a thrift store I figured I could do some experimenting with it. I discovered after trying different inks that Stazon was the best ink to use for stamping. 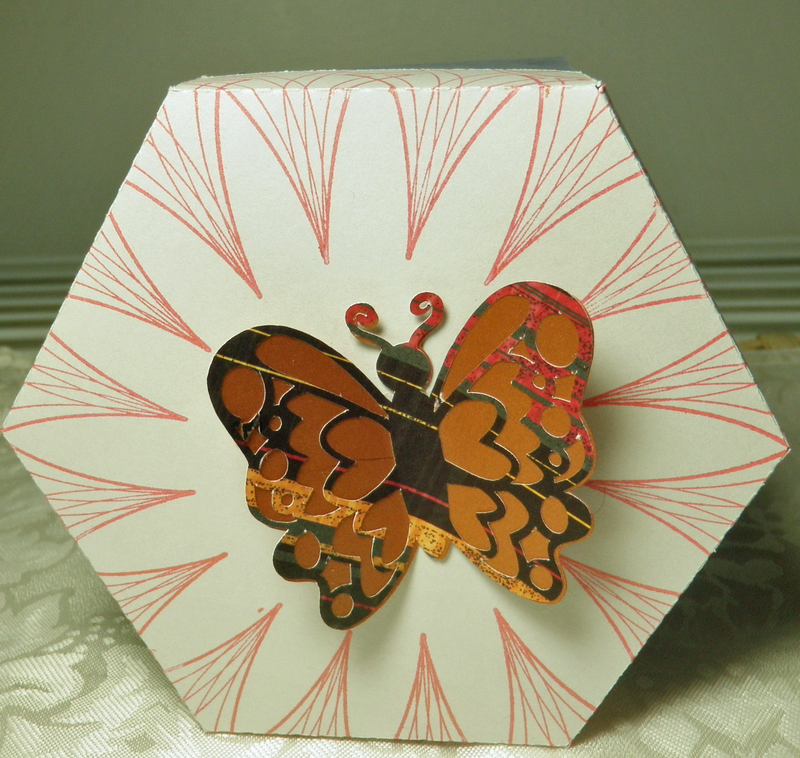 The small package was stamped using my leaf cube stamp and Cactus Stazon. Then I took my G Studio joy stamp and used Royal Purple Stazon. I was going to heat emboss joy over a leaf background for the larger package but discovered that the embossing powder stuck to the leaves even after it had been sitting for several minutes. That gave me the idea to stamp heavier in some places where the embossing powder would really stick and lighter in other. Then when I flicked with my finger on the back of the wallpaper where it was stamped lighter the powder came off. I love how some of the branches are copper and some are the original Cactus green. To finish the package I carefully made a loop of tape and attached it to the back of the ornament from the previous post and then pressed the ornament onto the package. One advantage to using wallpaper for wrapping paper is that it doesn't tear as easily. Which is good when you have a present like the big one here which is not flat but has things sticking out. The disadvantage is that it can be bulky so difficult to get nice corners. But then I flunked present wrapping 101. There you have it. My frugal tip is to look around and see what you can use when you don't have something instead of making a trip to the store. This ended up not exactly looking like the star ornament that was posted Here Next time I'll be more precise and make sure that both pieces are the same size. As well as be more precise when gluing the points. Still I like the way that it turned out and I'm sure that the person who gets this on a package will love it. I had Cameron my Cameo cut the strips a quarter of an inch by 8 inches. Next time I'll cut them shorter. As it is too big for any tree that I would place it on. I used Learning Tree double sided card stock which appears to be a medium card stock. I decided instead of dots on the points to use star gems since I bought a package of assorted sizes for $1 at a Dollar Tree store. Instead of using a strip of card stock for the hanger I decided to use some sheer ribbon. That's all for now folks. I managed to get a package in the mail and trying to finish the inside of cards to get them in the mail tomorrow. As well as finish some cards for my roommate. First I stamped my antique linen distress ink all over a scrap of white card stock left over from a print and cut. Then I sprayed water on the card stock and crumpled up the card stock. Since paper products are delicate when wet I carefully unfolded the card stock. Then I sprayed Stream alcohol ink which I mixed with water. The alcohol ink really brought out the lines where the card stock had been crumpled. 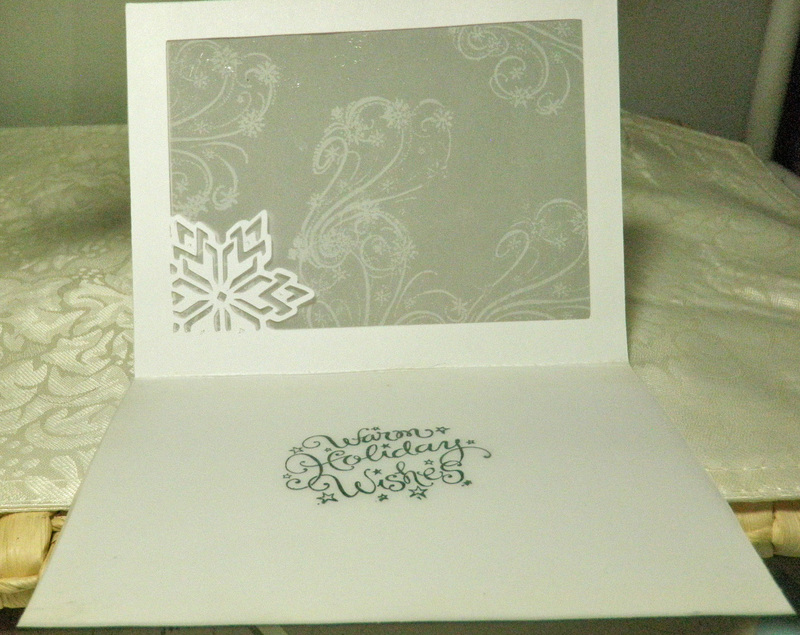 Because I didn't want to wait I dried the card stock with my heat embossing gun. Then because I wanted the card stock to be fairly smooth for stamping I ironed it in between two sheets of copy paper. I used my foliage cube stamp with Stazon Cactus ink for the background. First I inked and stamped on scrap paper to get a lighter stamped image on the card stock. Then inked and randomly stamped the normal way to get a heavier color. I used my G Studio Christmas stamps with Black Tuxedo ink. I got several cute sets for $1 each which I love to mix and match. I had been playing with a red gold ink on the Merry Christmas stamp and had not cleaned the stamp off. If you look carefully you can see some of the letters outlined with the red gold. LOL! I may on purpose do that again. I could have been finished at that point but discovered when making tags that heat embossing with just a coat or two with Ultra Thick Clear Embossing Enamel gave the impression of melted snow or ice crystals. I love the texture that resulted. There you have it my ten minutes of inky play. Thank you for stopping by and do come back. Wishing you Happy Frugal Crafting till we meet again. I have been as busy as Santa's elves trying to get things ready to get in the mail this week. I like to include an ornament that I have made so when I saw this 3d snowflake Here I decided to give it a try. I have to add something to hang it on the tree with but as you see it can also sit on a shelf,mantle,etc. I downloaded the gsd format. If you don't have a cutting machine which will use either gsd or dxf format there is a pdf file you can download. I decided after heat embossing one with winter wonderland embossing powder that I liked my Martha Stewart coarse crystal glitter the best. I sprayed the pieces with spray adhesive before putting the ornament together and sprinkled my glitter on them. The biggest pain in making this ornament is to get the tabs on the half pieces into the slots on a full piece. That is all for now folks. Thank you for stopping by and do come back. Wishing you Happy Frugal Crafting till we meet again! I must confess I have a box fetish and I love giving gifts in pretty boxes that people can reuse. Or at least I hope they will reuse them. LOL! Even if it is using them to give a gift to someone else. Anyway here is the box I came up with today. I had so much fun decorating this box. 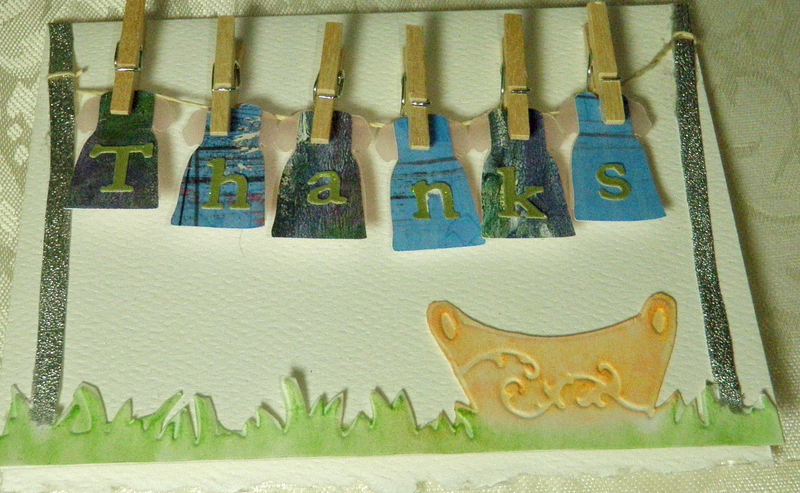 Especially since I finally got to use my Stamping Gear. I'm hooked now and will later do a post on it. 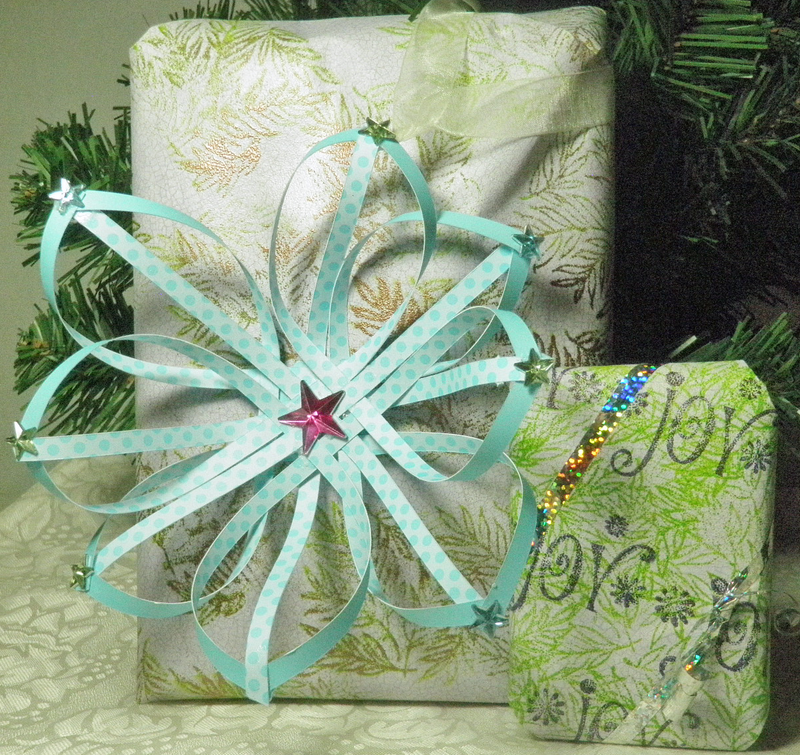 For the box I used the 3d snowflake box from the Silhouette store. I just deleted the snowflake which was on the lid. I love the size of this box and can see all kinds of possibility for decorating it. I love when I can use a file in a different way. I had fun playing on scrap card stock before committing myself to stamping on the lid. I tried out different stamps that came with the stamping gear intro set placing them different directions on the paddle. Also tried out different inks. It is a good thing I did as the red I was going to use smeared something horrible on this card stock. I ended up using my Red Gold. Although you can't really see in the picture it has a bit of shine to it. The butterfly was a free Studio file. 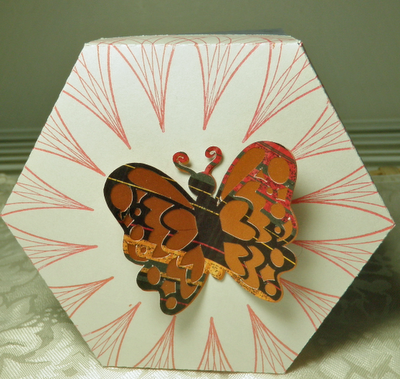 I used a scrap of plaid scrapbook paper with the butterfly on the diagonal when I cut it out. I then set the cut lines for edge only and cut out the metallic backing. The butterfly I thought was too flimsy with the scrapbook paper alone.I love how it turned out. There you have it my cute box which although not perfect I hope will be treasured. If you have a cutting machine look at your files and see how you might modify them. Especially if it is something you like. It can be a frugal way to craft. If you love stamping you might want to check out Inkadinkado Stamping Gear. You can make all kinds of fun designs using it. LOL! Not that I'm trying to enable you to spend money. Of course if you do decide to buy use a coupon or try to get free shipping. I found the intro set for under $14 and paid $7 using a coupon. With all the fun I had today playing it was worth the expenditure. O.K. I need to finish wrapping some gifts,get tags on gifts,and get things ready to mail Monday or Tuesday. Wishing you Happy Frugal Crafting till we meet again.